Eastern Wyoming College employees purchased gifts for local children and families for the holiday season. The College had a mitten tree and employees purchased toys, games, clothing and food for families in need. “The employees were so generous,” shared EWC Interim President Dr. Rick Patterson. EWC delivered the gifts to the Department of Family Services. Tickets are now available for one of the region’s most popular events, Sagebrush & Roses. This elegant evening features a western art show, dinner and dancing and is hosted by the Eastern Wyoming College Foundation. This year’s event will be held on Saturday, January 31, 2015 at the Goshen County Rendezvous Center in Torrington, Wyoming. Doors will open at 6 pm. Tickets are $65 each and may be purchased at the Goshen County Chamber of Commerce, First State Bank, Pinnacle Bank, Platte Valley Bank, and Points West Community Bank. Tickets are also available at the EWC Office of Institutional Development. The evening will begin with a western art show featuring local artists. An elegant dinner will be served and will be followed by dancing to Tom Martinez. Mr. Martinez played at the first Sagebrush & Roses which was held in 2007. Funds raised at Sagebrush & Roses benefit the agriculture and livestock judging programs at the College. For more information about this popular event or to purchase tickets please contact the College at 307.532.8397. 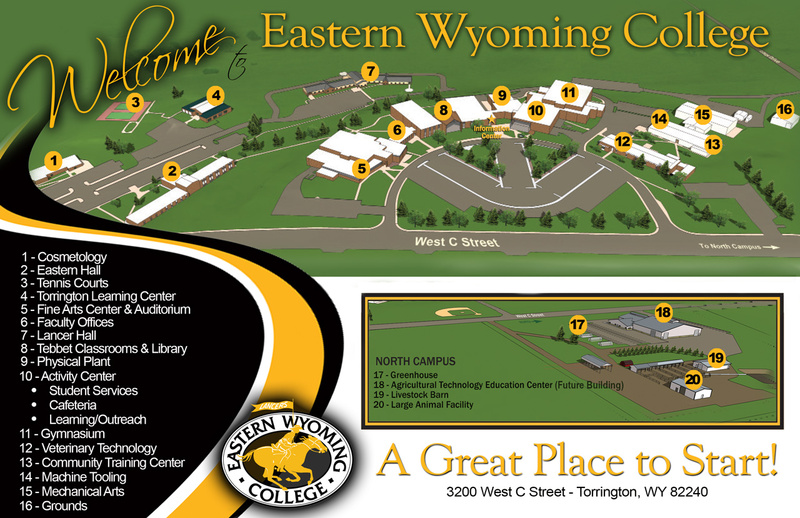 In the regular monthly meeting, the Eastern Wyoming College Board of Trustees announced the resignation of Dr. Armstrong, College President effective December 31, 2014. Armstrong was hired as the EWC President in July, 2008. “We recognize the many contributions that took place during his tenure,” shared EWC Trustee President Angie Chavez. In September Dr. Richard Patterson was appointed Interim President. Eastern Wyoming College rodeo coach Jake Clark and EWC alumnus and Wrangler National Finals Rodeo contestant Seth Brockman recently attended the Team Wyoming banquet during the WNFR in Las Vegas, NV. The gathering included Wyoming Professional Rodeo Cowboys Association (PRCA) rodeo committee members, stock contractors, contestants, Wyoming college rodeo coaches; as well as Wyoming Governor Matt Mead and United States Senator John Barrasso. “Wyoming is the first state to support professional and collegiate rodeo. The office of Wyoming Tourism goes above and beyond in how they support and promote these professional rodeo athletes and the Wyoming college rodeo programs,” shared Coach Clark. “On behalf of Eastern Wyoming Athletics and the EWC Rodeo Team, we want to wish alumnus Seth Brockman the best of luck at the WNFR. It is great to have alumni out there competing on the world stage. Charge on Seth, we wish you the best of luck from all your fans back at Eastern Wyoming College,” added David Vondy, EWC Director of Athletics and Fitness Center. Eastern Wyoming College has announced that four rodeo student-athletes have received recognition as 2014 Scholar Americans. The National Intercollegiate Rodeo Association (NIRA) recognizes student athletes who have earned points at a 2013-2014 NIRA sanctioned rodeo, been in college for more than one term, earned at 3.5 cumulative grade point average, and have been nominated by their rodeo coach. Cody Colman, O’Neill, NE; Josh Davison, Miles City, MT; Jacob Etzkorn, Fort Pierre, SD; and Sadie Gjermundson, Halliday, ND, each received this honor. “I’m proud of what these students have accomplished in the classroom. The hard work and time they have put in to their rodeo skills and their education is valued by their teammates and coach,” shared EWC Rodeo Coach Jake Clark. For more information about the EWC rodeo program please contact Clark at 307.532.8337 or by email at jake.clark@ewc.wy.edu. The Workforce Development office at Eastern Wyoming College in Torrington is offering a CPR & First Aid class on Tuesday December 16 from 5:30-9:30 pm. This class will be held in the Community Training Center on the main campus in Torrington and will cost $45. A CPR Basic Life Support for Medical Personnel will be held Thursday December 18 from 5:30 – 8:00 pm. This class will be held in the Community Training Center and the cost will be $45.